I expect to be adding more in the near future. There are some letters which shed light on "Minnie's" connection to the MENARY branch of the family and to Mary (Menary) WRIGHT in particular (they were first cousins). In her time, she was one of the repositories of family history knowledge so it is a pity that we do not have any more than this. I will be transcribing some letters shortly. She seems to have kept in touch with a branch of MENARYs who settled in Ontario, Canada. Thanks to Peter CALVERT, I know that "Mary ("Minnie") Wilson Calvert attended Abbey School, Armagh and was awarded prize of £4 in the Intermediate examinations (July 1880 - Armagh Gazette) schoolteacher. Miss Calvert‘s school at 1 St Mark's Place, Armagh, (advt. Aug. 1892 - Armagh Gazette) later became Armagh Girls High School, which amalgamated with the Royal School, Armagh, in 1970. Will pb. to William Calvert, Clerk to the Union." 1929 July 28 Letter This letter mentions family from Co. Wexford.These could be the family of John Handcock CALVERT, her brother who died in Co. Wexford in 1903. 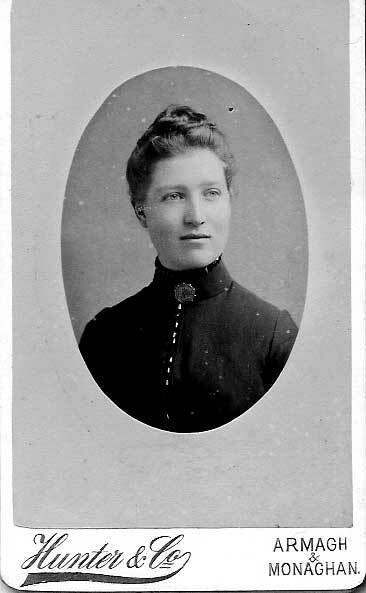 Enclosed is also a photograph that may be of the mature "Minnie". Undated letter from Nancy Menary This letter is to "Mrs. Calvert" who I am guessing would have been married to a brother of "Minnie". It concerns tracing the MENARY family connection.